Oxford University Press, USA, 9780199559909, 249pp. How important are genetic influences on behavior? How many genes influence an individual behavior, and how much influence does a single gene have? How do genes interact with the environment to influence the development of behavioral traits? What are the differences between humans and 'simpler' organisms when it comes to the genetic control of behavior? How Genes Influence Behavior is a unique introduction to behavioral genetics, which combines conceptual rigor with accessibility to answer questions such as these--answers that carry important implications for the nature of who we are. Offering unparalleled insights into how behavioral genetics is probed through real-world research, it considers evidence from humans and the major model organisms of mouse, fruit-fly and nematode worm to demonstrate how much of our current understanding of the genetic basis of human behavior stems from our exploration of other animals. Further, it uses these studies to connect the key themes of the book--the nature of gene action, and the inter-relationship of genetic and environmental influences on behavior-across organisms, highlighting key commonalities and differences. The book also shows the major impact that neurobiology is having on our understanding of the field, to give a true depiction of behavioral genetics in the 21st century. However, care is taken throughout not to overwhelm the reader with scientific detail. Instead, the authors make the book fun to read without sacrificing accuracy or devaluing the complexity of the subject matter: they 'personalize' the science, mixing more standard narrative with biographical details to make the subject come alive. With the media filled with talk of the discovery of genes 'for' an array of human behaviors, there has never been a more pressing need for today's students--tomorrow's researchers--to be equipped with a clear, balanced view of the field. 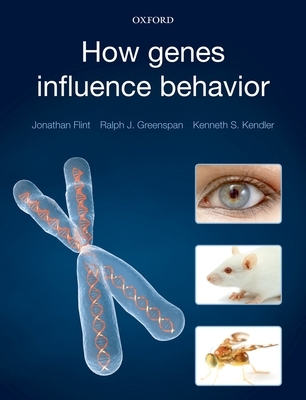 How Genes Influence Behavior is the perfect guide for all students, delivered in the words of three researchers who have witnessed first-hand the emergence of this fascinating field, and whose own investigations have been central to our current understanding of it. Jonathan Flint is a Professor at the Wellcome Trust Centre for Human Genetics, Oxford University. He has extensive experience in molecular biology, molecular genetics, and rodent behavioural genetics with a specific focus on models of anxiety. Ralph Greenspan is based at the Neuroscience Institute in San Diego. He has studied the genetic foundations of many behaviours in Drosophila, and has analyzed naturally occurring genetic variations in its behaviour. Kenneth Kendler is a Professor at the Virginia Institute for Psychiatric and Behavioral Genetics at the Virginia Commonwealth University. He has conducted family and twin studies on a range of psychiatric and drug use disorders, and has conducted gene finding studies for schizophrenia, alcoholism, and drug dependence.